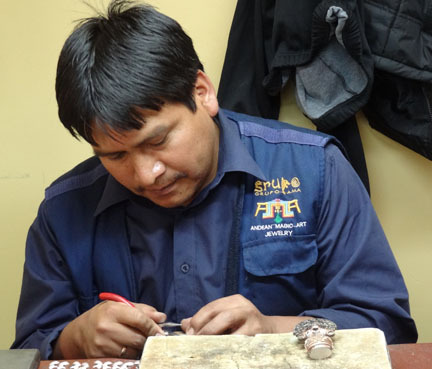 Francisco began apprenticing with Andean Magic Art Jewelry (AMA Jewelry) 11 years ago. He is originally from a small agricultural farm in Curahuasi, part of the Apurimac region, just North East of Cusco. Francisco now lives in his own home in Huancaro, near Cusco, with his wife, two daughters (aged 15 and 4) and a 10-year-old son. This artisan enjoys and excels at working with fine wires to make spirals or “circle of life” patterns. However, Francisco looks forward to having the opportunity to create sculptures in the near future. 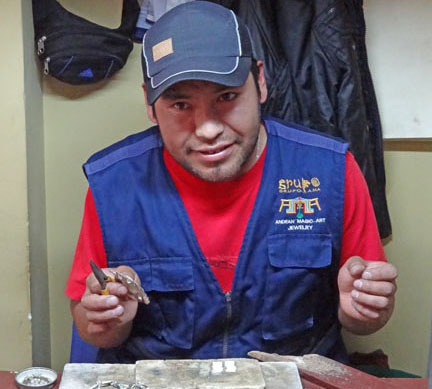 Erasmo left his family’s small farm in Paucartambo 11 years ago to apprentice with AMA Jewelry. He now lives in Huancaro, with his wife, son and daughter. Although works on a diverse range of items, Erasmo particularly likes working on necklaces and sculptures. He enjoys working with the metal to carefully form shapes within each piece. However his favorite part of the work is having the opportunity to expand his abilities by trying new things and creating original pieces. Isabelle has been working with AMA Jewelry for nine years. She is originally from Lamay, in the Sacred Valley near Tiobamba, where her family worked on a nearby farm. She now lives in Margen Derecha, near the Huatanay River, with her husband and two children: a boy, 17 and a girl, 6. She specializes in making complex bracelets with intricate relief patterns or textures. 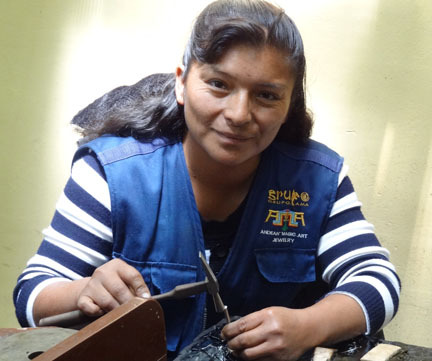 Isabelle enjoys giving shape to the jewelry by working with the tar to form it. The part of her job she likes best is working with metals and being under no stress. 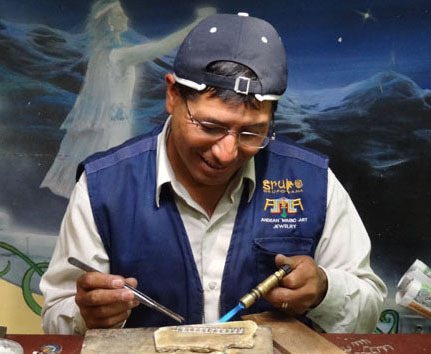 As AMA Jewelry’s veteran artisan, Juan joined the company as a young apprentice some 20 years (or half his lifetime) ago. Originally from an agricultural farm in Curahuasi, he now owns a house in Santiago but frequently travels home to visit family. Juan particularly enjoys creating Tumis (a figure representing the earthly form of God and said to bring its owner good health, prosperity and love) and believes this is where he does his finest work. He also enjoys working with fine silver wires to build complex patterns for semi-precious stones and shells. He lives with his wife and three children. From a young age, his five-year-old son has had cardiac problems, which required numerous operations and medications. Without his work as an artisan, he doesn’t think he would have able to pay for the special care his son needs.